Scottish money is fuelling the climate crisis. Divestment is about freeing our communities, institutions and government from the power of fossil fuel polluters. Grassroots campaigning around the world has led to thousands of organisations worth over $8 trillion committing to divest from fossil fuels, including Glasgow University, the first in Europe to divest. 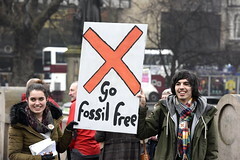 Nine organisations in Scotland have committed to go fossil free. This is a great start but there’s much more to do to. 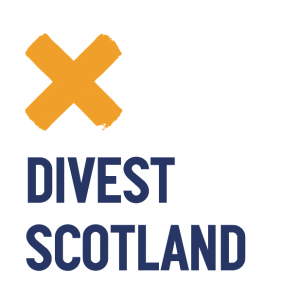 Take action on divestment and help us ensure Scotland’s future is fossil free. It’s time to Divest Scotland. This year the Scottish Parliament has an unprecendented opportunity to invest in a fossil free future. That’s why we’re calling for Members of the Scottish Parliament to pledge to divest Scotland from fossil fuels. With MSPs’ support, we can ensure that their pension fund and the forthcoming Scottish National Investment Bank promote clean jobs instead of fossil fuels, unlocking billions of pounds to build a zero-carbon future. Take our e-action below to ask you MSP to take the pledge. Ready to take the next step and meet them face-to-face? Read the campaign briefing, learn some top tips for meeting MSPs, and print a poster so you can share their support on social media. Last year Ireland was the first country to divest from fossil fuels, a visionary step towards building a sustainable future. Nicola Sturgeon says Scotland should lead the world on climate change, so we must take similar action. Ask your MSP to divest their own pension fund and ensure the new National Investment Bank is fossil free. Scotland is phasing our fossil fuel cars and has stopped fracking, yet our local governments still invest billions in fossil fuel companies through their pension funds. Councils across the UK are beginning to divest – can Scotland follow? Do you need help, guidance or resources to get your campaign up and running? We have plenty of information available if you are interested in campaigning for fossil free pensions in your Council area. These how-to guides, briefings and more will also be useful for campaigning at universities, churches and other institutions. Give us your email address and we’ll send you updates about Scotland’s fossil free story.